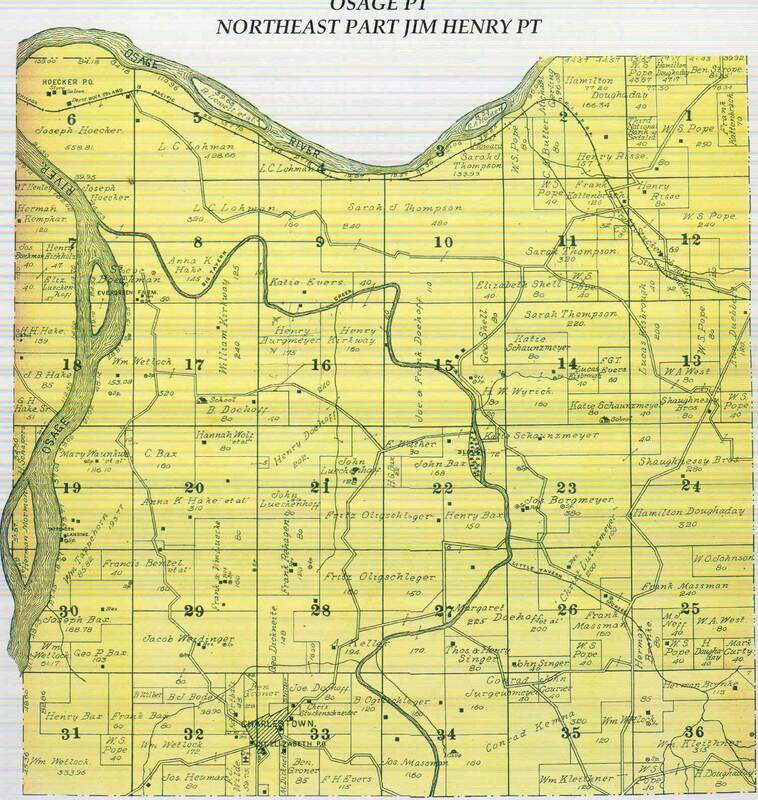 The most important early event in the history of Miller County regarding its growth and development was the coming of the railroad; first the Missouri Pacific in 1882 and second, and even more importantly, the Rock Island in 1903. We are fortunate in having some old photos of scenes from the days of the early Miller County railroads which recently were sent us by Mike Wieneman, former Eldon resident, who is an avid Miller County historian. So I thought I would devote this week's edition of Progress Notes to the historical railroads of Miller County. What is strange to me is that while the railroads were so very important to our county's growth in the last part of the 19th and first half of the 20th centuries, they no longer exist here. However, the disappearance of the railroads didn't just affect us but was a nation wide phenomenon in many areas of our country. A Look Back") as well as Clyde Lee Jenkins' book, "Judge Jenkins' History of Miller County V11." Information about William Bagnell and his construction company was obtained from author Gary Kremer, who several years ago wrote a column entitled "History Matters." I am also very dependent upon the services of David Statler who is the one who weekly uploads my narrative and photos to the website. David is the one who catches many of my mistakes, touches up the photos, and even occasionally contributes photos for me as he did this week. According to Clyde Lee Jenkins, much "agitation" for a railroad to cross through Miller County began as early as 1866, the year following the Civil War. The Miller County Court first initiated attempts to bring the railroad to the area in 1870 floating a $75,000 bond issue to aid in its construction but the bond was voted down by county residents who in the turmoil of the immediate post war effort didn't trust the "bond seekers." 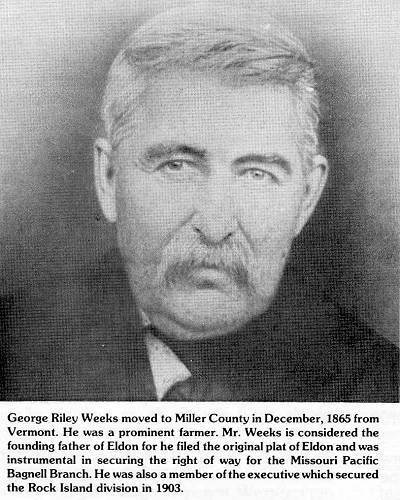 However, visionary George Weeks (photo 01) of Eldon along with business men of the then booming Aurora Springs accumulated the money to obtain the necessary right of ways to entice the Missouri Pacific Bagnell Branch (then called the "Jefferson City, Lebanon, and Southwestern Railroad") to come through Eldon and Aurora Springs. 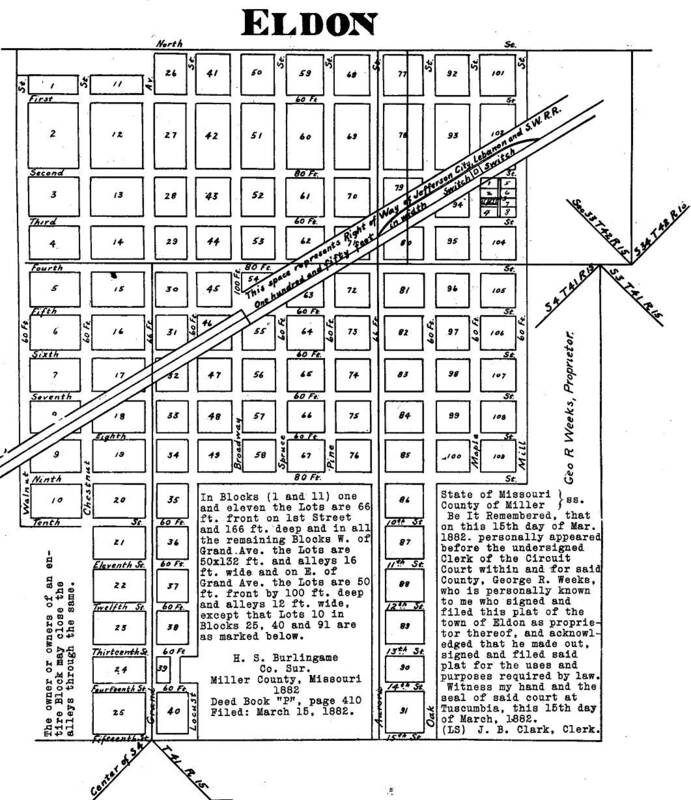 George had plotted out a map of streets of Eldon (photo 02) expecting that the train depot would be on Grand Avenue, the street George originally had intended to be the main street of Eldon (notice how the street map laid out the diagonal path of the soon to come railroad line). However, after the tracks had been laid and the first train made its way to Eldon, the grade was too steep on Grand Avenue where the depot building was to have been built and the brakes wouldn't hold. The train rolled backward to stop naturally on the east side of Second and Maple Street. 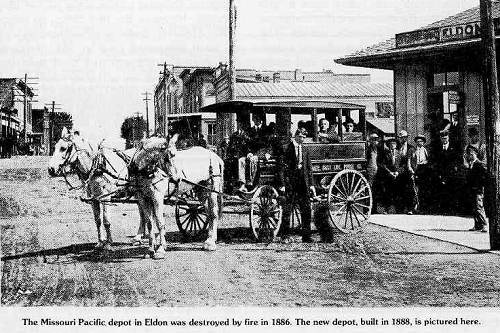 And so, that is where the first Missouri Pacific depot of Eldon was built in 1882. It was destroyed by fire in 1886 but a second building was completed in 1888 (photo 03). This new railroad line, (known popularly as the "Bagnell Branch") according to author Gary Kremer, connected Jefferson City on the north to the town of Bagnell to the south with stops along the way at Scruggs Station, Lohman, Russellville, Enon, Olean (photo 04), Eldon (photo 05), Aurora Springs (photo 06) and Cooper's Station. An old 1903 plat book of Miller County reveals the line which the Bagnell Branch took from Olean to Bagnell (photo 07). "The railroad line, as well as the town of Bagnell, was named after the contractors who brought the railroad here. Known as the "Bagnell Brothers Construction Company," it was made up of four brothers, all of whom were born in the town of Rowden, Canada, during the two decades prior to the American Civil War. 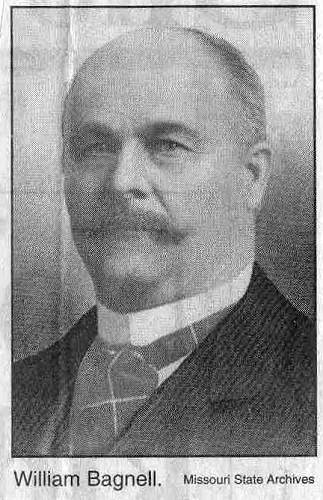 Robert Bagnell, born in 1841, was the eldest of six children born to William and Amelia Bagnell, successful Canadian entrepreneurs. A graduate of Bryant and Stratton College of Toronto, Canada, Robert Bagnell moved with his parents and siblings to Chicago in 1864 becoming a contractor and railroad builder. Brother William, arguably the most successful of the Bagnells, was born in 1843, Thomas in 1845, and Samuel in 1854. 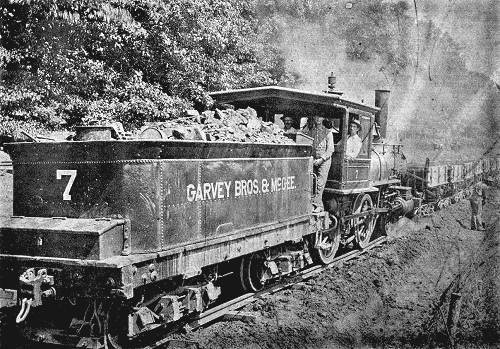 The three elder Bagnell brothers formed a construction company in 1869 (younger brother Samuel joined the family business later), and, according to contemporary accounts, built railroads throughout the United States, including a number for the "Robber Baron," Jay Gould. Presumably, that is what brought them to Miller County, Missouri, for Gould owned an important interest in the Missouri Pacific Railroad by 1880. The building of the Bagnell branch was anything but smooth. Conflict reigned between the Bagnell Brothers Construction Company and the people hired to clear out the railroad right of way. In particular, William Bagnell (photo 08) and W.C. Berner fought a protracted legal battle over Bagnell's refusal to pay Berner for work that the latter had done. Bagnell hired Berner to clear railroad right of way at a rate of $9.50 per acre, but balked at paying Berner when he complained to Berner that his crew's work was inadequate. In addition, the Bagnell brothers seemed often to be at odds with their mostly Irish work crew of railroad builders. (Note: according to Clyde Lee Jenkins, one of the reasons Irish immigrants were used to build the Missouri Pacific Railroad was due to strong encouragement by the nation in general to acquire more laborers for the expansion of the railroads. In fact, Miller County in 1880 organized its own "Immigration Society." More details about the Irish laborers who built the Missouri Pacific Railroad including their names can be found on pages 81 and 82 of Clyde Lee Jenkins' book referenced above). they take passage to and from Jefferson City on it almost every day." 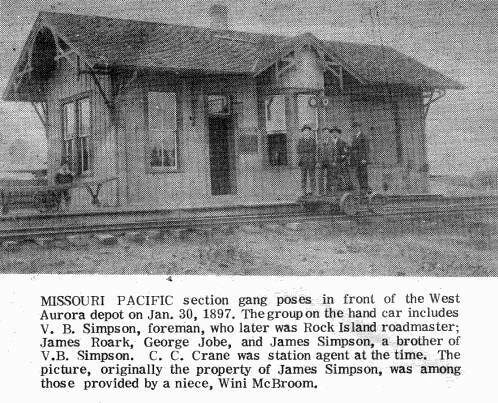 By April of 1883 the railroad had passed through Eldon and reached Cooper's Station (located between Aurora Springs and the Mt. Carmel area) when the local management temporarily ran out of funds. At that point William Bagnell himself arrived to oversee the job along with his superintendent, civil engineer Andrew F. Donnan. Bagnell pitched his tent near what is now known as Wright's Creek along with 58 laborers and 114 teamsters. Track was being laid over Ezekial Wright's property. According to Clyde Lee, "a few days later (after the track had just been laid on the Wright farm) the first iron horse, rolling slowly, moved upon the Wright farm. Having heard it was coming, the inhabitants in the hills and hollows of southern Franklin Township came to look upon it. When the engine stopped, everyone commenced crowding in, especially the children, and when close enough, fireman Jim King, pulling the whistle cord, scattered the crowd like a flock of chickens scared by a fox!" 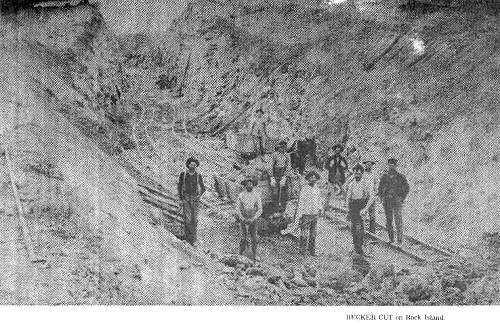 Under Bagnell's supervision during which he was constantly fighting with W.C. Bernan about clearing the line path, the railroad finally was completed to Bagnell in July of 1883. It was said that the engine (photo 09) pulling into Bagnell for the first time "exchanged whistles with a sternwheeler moving up the Osage River." "My great-great-grandfather, Robert Bagnell, a Major in the British Army (I don't know what regiment), emigrated from Staffordshire to Rawdon, Quebec, in Canada, in the mid 1800s. He became a successful broker, or dealer, in timber and furs. Three of his sons, William, Robert, and Thomas - Thomas was my great-grandfather - became attracted to the booming railroad business around Chicago, and moved to the US. The oldest son, William, was the leader, and according to a St. Louis newspaper article I read, he learned the business under one of the famous "robber baron" railroad builders in Chicago. Eventually, by about 1885, the brothers had moved to St. Louis, Missouri and established Bagnell Brothers Timber Co., to provide railroad ties (I think these are called "sleepers" in England) for the railroad lines, and another business through which they contracted to build rail lines. They became regionally prominent in their chosen industry. They built railroad lines, were involved in financing, buying, and selling pieces of some railroads, and eventually expanded into real estate and buildings in downtown St. Louis. Great-great Uncle Will lived the longest of the brothers, and was a millionaire a few times over when he died in 1927. 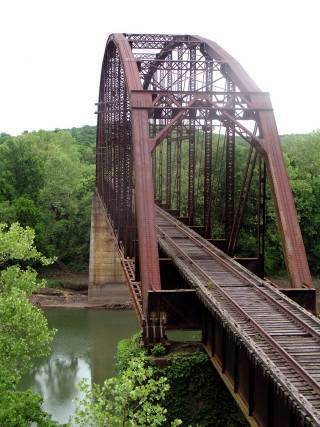 To get timber for the railroad ties, they built a spur line to the south and west of St. Louis, down into the northern edge of the Ozark region, near the Osage River. They built a large turn-about at the terminus to turn the trains around, and eventually employed quite a large crew to cut the timber, shape the ties, and man the engines. A boom town grew up around this terminus, and it had stores, at least one saloon, some businesses, and several homes. The town was named Bagnell after the brothers and their business, and they often visited in their private railroad car. 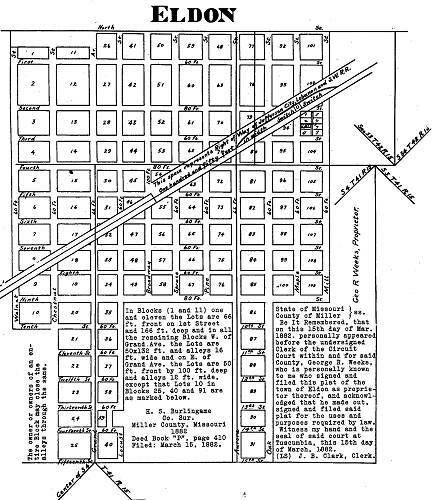 About 1890, my great-grandfather, Thomas Bagnell, bought a large (a little over 2,000 acres, or about 800 hectares) cattle farm that he'd seen while they were planning the track building for the Missouri Pacific railroad line that runs westward from St. Louis (the Missouri Pacific line is now part of the Union Pacific System). The farm was named "Elk Hill," and the brothers immediately ordered a large stock of china from Staffordshire - John Maddock & Sons, I think - with the farm's "Elk Hill" logo, and an even larger second order, a heavier stoneware style, from a factory in New Jersey. I grew up using these dishes, as did my father (Thomas) and my grandfather (Robert) - in fact the whole family did. We still have a good supply of the stoneware version today, and I still use mine. In the 1930s, I think, plans were made to build a large hydroelectric dam on the Osage River, which would create a huge recreational area and provide electricity for, I believe, the Kansas City Power and Light electric utility. 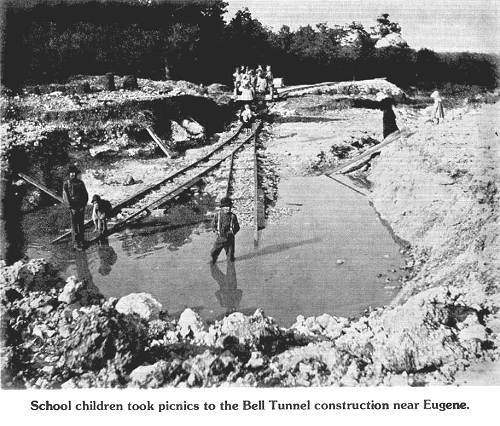 The dam was named after the nearby town of Bagnell, which enjoyed a second boom from the construction. So, the town was named after the Bagnell brothers, and then the dam was named after the town. And that's the way it was." 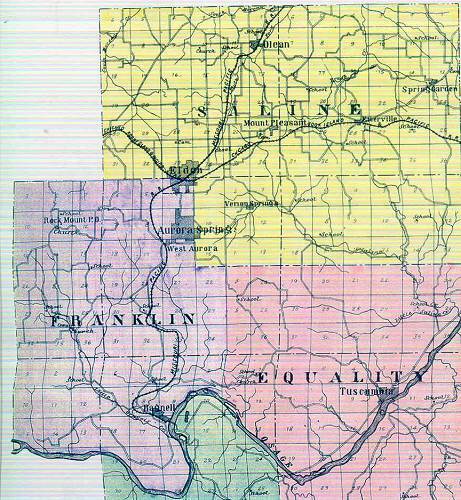 The original name of the Missouri Pacific Bagnell Branch, "Jefferson City, Lebanon, Southwestern line," implied that the railroad was meant to have crossed the Osage River at Bagnell to make its way to Lebanon, Missouri. But as the above narrative indicates, the Bagnell Brothers Construction Company really was a railroad construction business. 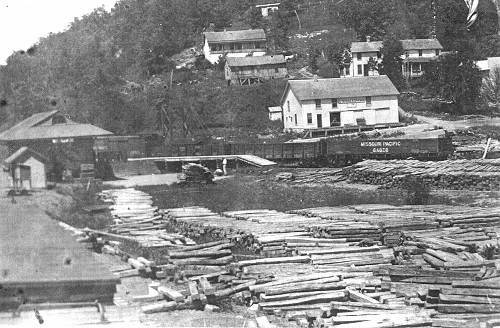 Much money and time could be saved to acquire railroad ties if a train could come to Bagnell to pick the ties up rather than have them floated further downstream to Osage City, which required three extra weeks for delivery. Most likely, the Bagnell brothers never intended for the railroad to go further than Bagnell. For example, the Missouri Pacific depot building in Eldon was small and never enlarged; so it appears that the line cared more about transport of ties than other types of haulage. 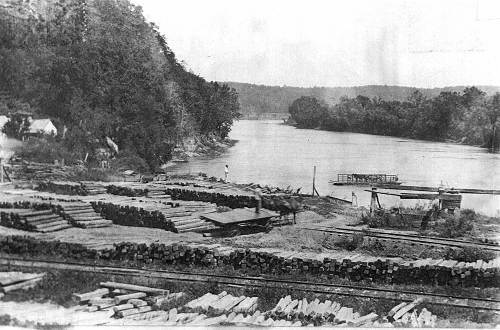 Sometimes it was said that more than thirty thousand wooden ties were stacked along the bank of the Osage at Bagnell. Here are some old photos of Bagnell and the tie yard (photo 10, photo 11, photo 12). In 1900 the population of Eldon was 379, according to Tina Raynor. However, in 1904 the population had suddenly swollen to 1566. The reason? It was because the Rock Island Railroad had come to town. Rumors had started floating around town in 1902 that the St. Louis, Kansas City, Colorado line (on the old plat map it was called the Chicago, Rock Island, Pacific railroad) was thinking about coming through Eldon. The big question though was whether the line would establish Eldon as what was called the "division point," which would mean that a large depot would be built along with several other structures for maintenance and repair of the engines and cars and also for storage. Some rumors had it that Henley might be designated by the railroad line as the division point. Even so, just the thought that another railroad was coming through town stimulated new arrivals to Eldon anticipating work and new businesses being planned and built. 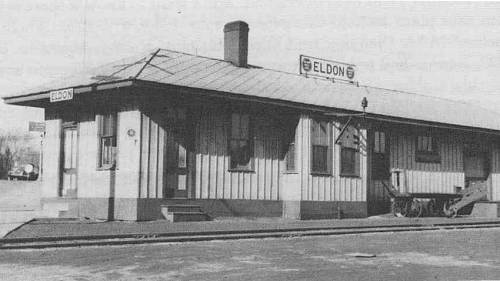 To encourage the railroad to designate Eldon as the division point an executive committee of prominent Eldon citizens was established to work out the details and incentives that the railroad line was requesting. 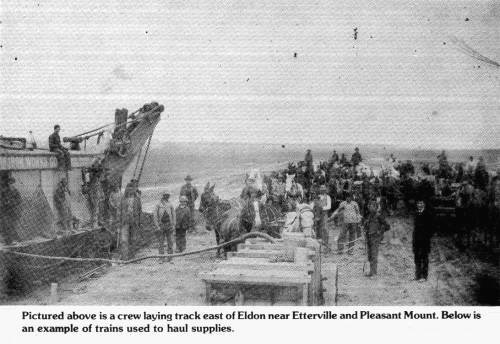 On June 11, 1903 the committee completed the work required by the railroad company to locate the shop and division in Eldon. The railroad, which by this time was being called the "Rock Island," began to ship in equipment to build the division buildings. At the same time numerous businesses were being started in the area almost immediately as well. Houses were being built for the anticipated arrival of hundreds of workers for the railroad line. The headline of the October 2, 1903 issue of the Eldon Eagle read, "The Iron Horse of the Great Rock Island Approacheth." Track was being laid at one mile each day. 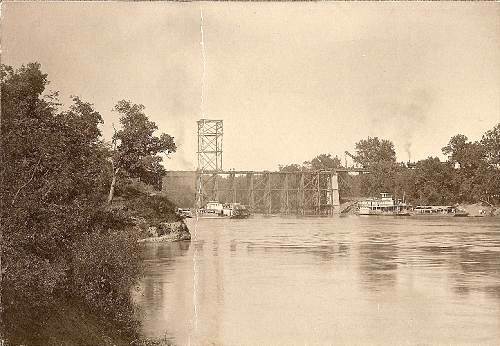 The bridge (photo 13, photo 14) at the Hoecker bend of the Osage had just been completed and the tracks laid to Henley. This stretch of the line was known as the Becker Cut. 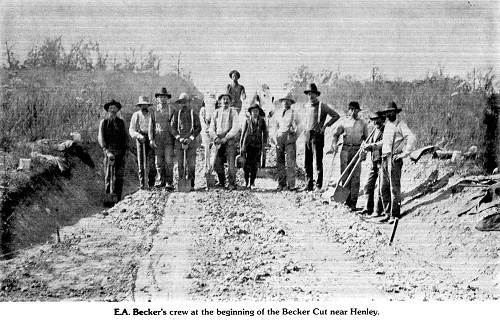 Emil Becker of Eldon and a crew of fifty teamsters with mules was contracted to lay the road bed (photo 15, photo 16). 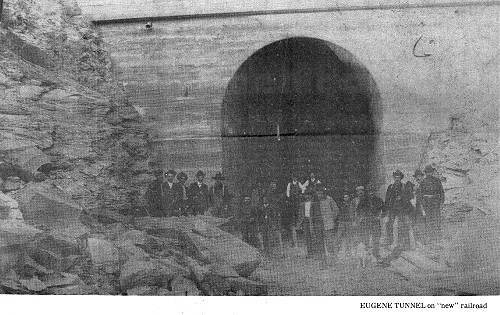 The railroad had to construct a tunnel at Eugene as well (photo 17, photo 18). 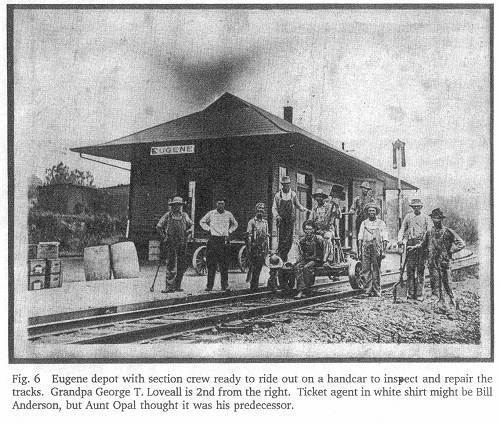 A depot station at Eugene was built (photo 19). Here is a photo of construction of the line near Etterville (photo 20). Another photo shows a supply train used in the building of the track line (photo 21). 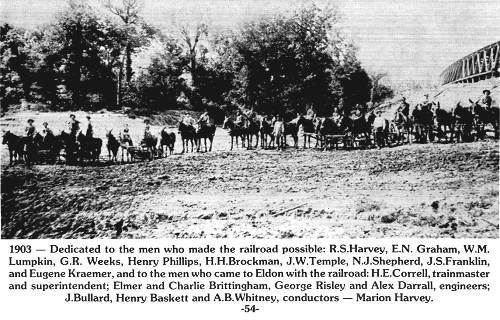 When the laying of the line came to the edge of Eldon a number of workers and others instrumental in bringing the Rock Island posed for a photo (photo 22). On October 23, 1903 the first Rock Island engine (photo 23) reached Eldon and on November 8 the first regular passenger and freight service began on the Rock Island railroad through Miller County. The Rock Island depot (photo 24) and round house (photo 25) were impressive structures, especially compared to the Missouri Pacific depot. In later years when railroad business was declining, the building was replaced by a much smaller one (photo 26). 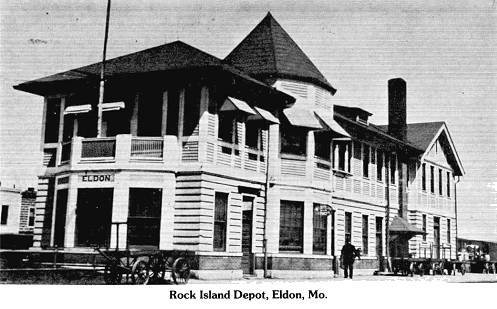 However, during its heyday the Rock Island was an exciting place to work and there are still a number of "old timers" in Eldon who meet on a regular basis. Some of the ones who are remembered but are no longer with us include N. H. Richardson, conductor, who worked fifty years in the railroad industry (photo 26a). 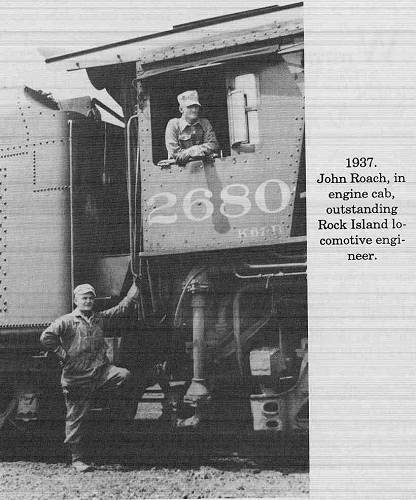 One of the more famous Rock Island engineers was John Roach (photo 26b). Bamber Wright of Tuscumbia told me a cousin of his, Joe White, also was an engineer in the later years of the railroad, and Bamber's son, Jack, spent much of his free time with Joe riding the rails of the Rock Island in the years just before it shut down its operation sometime in the early eighties. The route of the Rock Island on the east entered Miller County out of Osage County, headed north toward the Osage River and followed the river up to the Hoecker Bend where the new bridge was built. 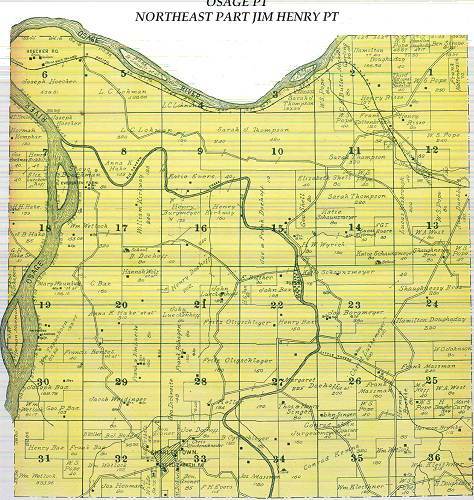 Here is a photo of the 1903 plat map of the Rock Island line in eastern Miller County (photo 27). From the Hoecker bridge it headed into the southern edge of Cole County going to Henley and continuing west to Eugene where it went through the Tunnel. From Eugene it continued west on into Etterville and then to Eldon. Leaving Eldon it followed what is now highway 52 on into Morgan County. 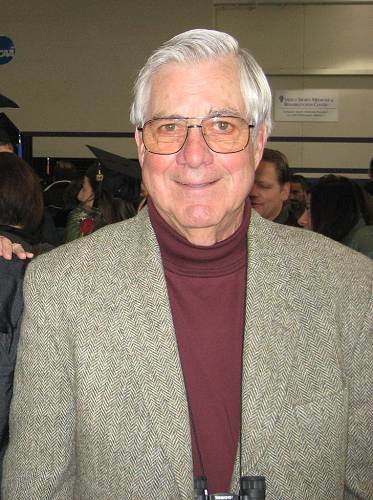 Bob Richardson, who was born and raised in Eldon, was the son of one of the men who came to Eldon in the early 1900's to work on the Rock Island. 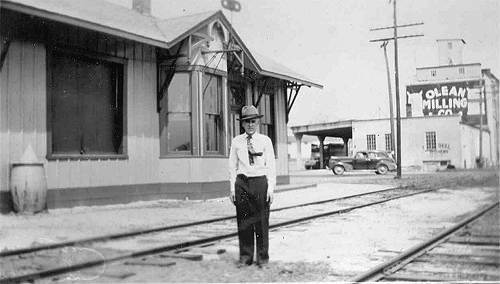 His father had been a brakeman before coming to the Rock Island where he worked as a Rock Island Conductor. Bob wrote a book about his early boyhood life in Eldon which he named, "Up The Caboose" (photo 28). I have referred to his book several times on previous Progress Notes' pages and it is especially fitting that I include some of his memories about the Rock Island. 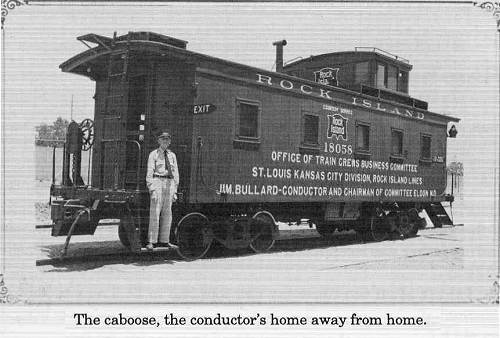 The first narrative copied below describes how he derived the name of his book, "Up The Caboose:"
When I was a very small boy, my dad took me to St. Louis on a Rock Island freight train, of which he was conductor. A little past midnight, we walked through the park and across the tracks to the huge depot. In the train office, Dad signed the crew register and picked up his train orders and waybills. Then we walked through the darkened yards in the caboose track. The caboose fascinated me. It was like a small house on wheels (photo 29). I kept staring up into the dimly lit well of the cupola. Located amidships, the cupola sat atop the caboose, giving the conductor and rear brakeman a commanding view of the train. After we got underway, I said to Dad," Can I ride up there?" I pointed to the cupola. "Up the caboose?" He and the brakeman laughed. "That's the cupola," Dad said. He pronounced it "kew- puh-low." He hoisted me up to the cupola seat and I rode with my back against his chest. He had doused all the lights and from our dark enclosure we could plainly see the stars wheeling in the universe. We roared through Etterville, past huddled lumps of houses squatting in the night. 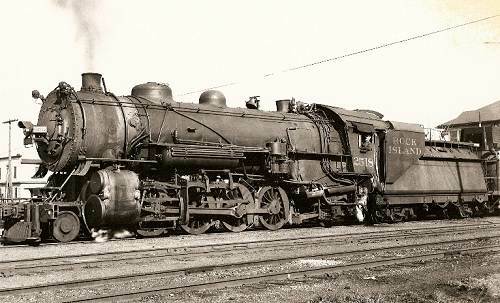 Dad's bass voice vibrating against my back, and the lonesome cry of our locomotive's whistle, made me drowsy. The next thing I knew, Dad gently shook me awake. "I'd better put you to bed," he said. As I climbed down from the cupola, Johnnie Morrow, the brakeman, chuckled and said, "Bob, after you get some rest, come back up the caboose." 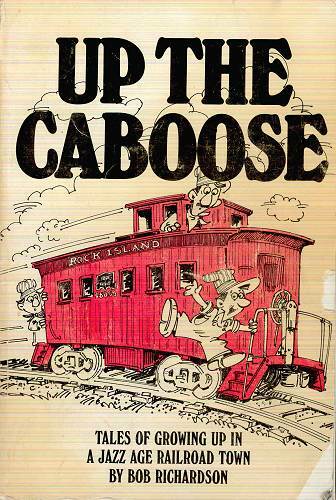 The railroad caboose is rapidly vanishing from the American scene. When I see one of the few remaining, I'm reminded of the glory days of my childhood when Eldon was a railroad town, and my father was a conductor on the Chicago Rock Island and Pacific Railway. I think of all the times my dad took me to St. Louis to see the Cardinals and Browns play baseball in Sportsman's Park, the legendary old ball yard at the corner of Grand and Dodier. We always rode the caboose of freight train No. 92 East, pulling out of the Eldon yards a little after midnight. One particular trip stands out in my memory, the most eventful day of my young life. After Dad signed the train register and picked up his train orders at the depot, we walked through the darkened yards to the caboose track. We arrived at our caboose just as Bill Hauenstein, the senior brakeman, was hanging markers (signal lights) on the rear platform. The caboose fascinated me; it was like a small house on wheels---a land-going yacht, as B&O Marr put it. A special house that gave off the faint aroma of coal smoke, and was illuminated by kerosene lamps securely bracketed to the walls. Two of the lamps, with reflectors, lit up the conductor's desk. His "office," so to speak. There were complete kitchen facilities, including an ice box, a kerosene cook stove, a cupboard to store dishes, flatware and staples. A dining table folded against the wall. There were bunks for the conductor and two brakemen to bed down in at the end of the run. Beneath the cupola were lockers for storage of torpedoes, fuses, signal lanterns, waste for journal boxes and other supplies. There were closets for storage of rain gear and clothing. The main attraction, for me, was the cupola. Located midship, the cupola sat atop the caboose, with seats on either side for the brakeman and conductor, who kept a sharp lookout for trouble, such as overheated journal boxes. At daylight, Dad roused me out of his bunk, where he had put me to bed as we left the Eldon yards. He let me climb up into the cupola. This was a big time thrill sitting atop the train, looking out over the bouncing, hurtling boxcars, the locomotive far ahead laying a mare's tail of smoke and steam over the train. When we went around a curve, the engine's drivers could be seen working furiously. A stirring and memorable sight you'll never see with today's diesel engines. We thundered through small towns, leaving in our wake a cloud of cinder dust, and a station agent standing on the depot platform, waving. I wouldn't have traded places with the President of the United States of America. I was king of the realm. We finally arrived at the Carrie Avenue yards in St. Louis. After Dad washed the coal smoke out of my ears and dropped off his consist and wheel reports at the train office, he said to me, "This is your day. Let's have some breakfast and do the town." Dad usually meant what he said. But I figured a test wouldn't hurt, so at the Greek's restaurant on North Broadway, I said, "Can I have cherry pie and ice cream ?" Which I did, but only after eating a plate of scrambled eggs and pancakes. We rode a North Broadway street car over to Grand Avenue and the theater district. In those days, the big St. Louis theaters offered movies and vaudeville acts from 9 AM till midnight. Here, I was boggled by the bright lights of the theater marquees, the hurrying crowds, the big city clamor of streetcars, honking autos and the strident voices of small boys hawking newspaper headlines in an Unknown Tongue. The Ambassador was a gorgeous theater. Its rest rooms were larger than the entire Electric Theater in Eldon. A feature attraction was Eddie Lowry, the legendary master of ceremonies. The vaudeville bill was headed by Ben Blue who sent me into hysterics with his deadpan dance routines. The movie was very forgettable. Dad slept through most of it. I stayed awake so that I could shake him every time he snored. We arrived early at the ballpark, so that we could watch the players take batting and fielding practice. In those times, the Cardinals' and Browns' games started at 3 o'clock. The Cardinals and the Brooklyn Dodgers staged a knock-down-and-drag-out slugfest, which the Cardinals eventually won. Most of the fIrepower for the Cardinals was furnished by Chick Hafey and Jim Bottomley; Babe Herman and Del Bissonette rattled the fences for the Daffiness Boys. All through the exciting action, I continued to test Dad's generosity. I arrived at our caboose stuffed to the gills with hot dogs, Whistle soda pop and Pevely ice cream bars. On the way home, the train broke down at Belle. Pulled the drawbar or something on one of the freight cars. The caboose was out in the country and Bill Hauenstein went back some distance to flag down any train that might approach from the rear. Dad went up ahead to the depot, leaving me alone in the caboose, with the pitch black night and the barking of a dog as my only companions. As the leading coward of my time, I began seeing goblins and backward flying ginny whiffets. Being stuffed full of junk food didn't help my state of mind. Then the wolves came and surrounded the caboose, demented, soprano voiced wolves that howled in quavering, lunatic ululation. I was about to crawl out of my skin when Dad came aboard the caboose. He took one look at me and said, "What's wrong?" "Wolves," I piped. "There they go again." He said, "I shouldn't have left you back here alone. Another five minutes and you'd be seeing turkeys wearing plug hats." He smiled. "Those wolves are a load of sheep in the third car from the caboose." For months afterward every now and then Dad would say to me, "How does a wolf howl?" And I'd answer, "Baaa!" It really wasn't much as places go. Yet, it was really pretty special. A little over 53 acres of land straddling one of the upper branches of the Little Saline Creek in Miller County, Missouri. Fifty-three acres is hardly enough to make a living on if it is good land and this was anything but good. In fact, most of it was so rocky and underlain with hardpan clay that it wouldn't even grow good timber. I never really wanted to make my home there but I always went back every chance I got as long as mother and my sister, Marie were alive. One of the big events when I was about six or seven was that we got a well. Up until then we carried all our water from a spring, which was located about 75 yards from the house next to the creek along the south property line. Not only did we carry all the water for use in the house, we carried it for the chickens in the two houses, which were beyond the house. When the creek would overflow, which it did every time we got a heavy rain, it would flood the spring. This meant digging out all the mud and other debris, which would fill it and then letting it run for several days to avoid any contamination from the creek water. Mother told the well drillers that she wanted the well to be as close to the back door as possible so she wouldn't have to carry water any further than absolutely necessary. At the time she was figuring on a bucket with a pulley and a rope. I guess Mr. Spencer took that as a challenge because he put the well down about three feet from the back door. My Uncle Harry Chalmers, who was a carpenter, said, "You know, Nan, what you should do is build a screen porch around it". One thing led to another and before I knew it the screen porch had been totally enclosed as a kitchen, cabinets with a sink built across one end and a pitcher pump installed. We had running water as long as your arm was strong enough to work the pump handle. The barns were always a place of interest to me when I was small (photo 30). They were two log cribs set in a line about 15 feet apart. A gable roof extended the full length making it, in effect, one structure. The one to the north was exclusively for hay storage, top to bottom. The other was always referred to as the horse barn since the lower part was partitioned to hold two horses with approximately the upper third being a loft for hay. 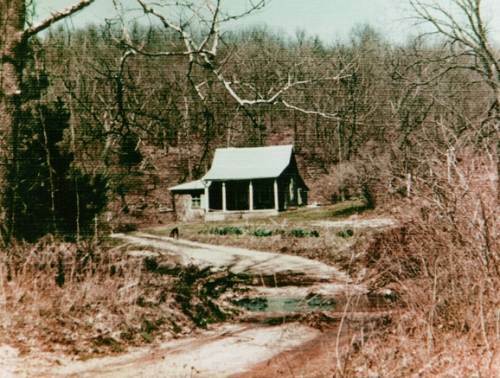 The cow barn was a shed built against the rock bluff with the bluff forming the back wall. Since it was located back in the hollow and the open side faced south, our cows were always warm and dry in the winter. The house (photo 31) was sort of a ramshackle affair that, like Topsy in Uncle Tom's Cabin, had just grown. I guess it had started out as one room about 12 feet square with an attic overhead. I don't know if it had been there originally or if my folks had added it but someone had tacked on a lean-to room at the back. To take advantage of the roofline and the sloping terrain, the floor was about two feet lower than that of the other room. With a large family to accommodate, my folks had added another room along the north side, which ran the length of the other two. The interesting thing about this room was that the walls were of poured concrete. And, of course, the kitchen was added when we got the well. It was also an attached shed with the floor being about 10 inches below that of the adjoining room. Even with the floors being at different levels, the ceilings and doorjambs were pretty low. By the time I got my growth I had learned the hard way to duck my head when I went through the interior doors. I still have a couple of scars above the hairline to remind me that I was a pretty slow learner. The attic was really just that with the only space where you could stand upright being in the middle directly under the ridgeline of the gable roof. Since it wasn't very tightly constructed it was always a haven for wasps and mud daubers in the summer time. It was also very hot in the summer and only moderately warm in the winter when there was a fire in the heating stove down below. With a metal roof overhead it was very soothing to sleep there during a rain. Of course, it was also pretty noisy during a hailstorm. There was room for a bed, a small dresser and a pole nailed across the rafters for hanging clothes. Since storage space was limited in the rest of the house, this ended up being a catchall as well as a bedroom. Mother had had to make do with whatever was available all her life so she rarely threw anything away. Various mementos, seasonal items and a lot of just plain junk ended up there. It was all stuffed away in the low overhead areas along the sides. This became my room and remained the place where I slept as long as the house stood. Even though it was small and crowded, my mother and sister always welcomed family and friends and would make arrangements to seat however many folks who were on hand around the dining room table. You sure had to keep your elbow close to your side when you were eating or you might stick it in your neighbor's mashed potatoes. My nephews and nieces, and my kids as well, always delighted in going there. Grandmother and Aunt Marie taught them all to fish for crawdads with a piece of bacon on the end of a string tied to a short stick as a pole. They would ease the bacon down in front of the rock under which the crawdad was hiding. When he reached out and grabbed the bait with his claws, they would pull it out of the water and pounce on it with a tea strainer and plop it into a bucket. When you're no more six or seven, the thought of being nipped by those awesome pinchers is pretty frightening. As they got older, most of them learned to distract the critter with one hand from the front while they grabbed him from the rear with the other. We frequently used them as fish bait but sometimes cooked the tails and had them as an appetizer with a cocktail sauce of one sort or another. 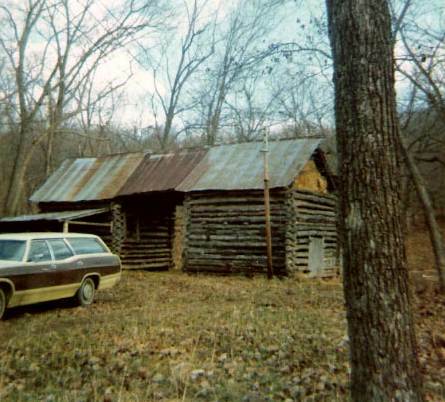 The log barns were great for climbing on when they weren't full of hay. Often times we would rig a stout rope across between them and attempt to make it hand over hand from one to the other. There was at least one occasion when Jay Brockman, Harold Hill and I found a nest of eggs, which a hen had hidden in the loft. They had been there quite some time so we used them as hand grenades in one of our war games. I don't remember if we scored any direct hits but even a near miss could get your attention, as they smelled pretty bad when they broke. In 1980 Marie built a new, modern house and the old one was razed. I happened to be there visiting her shortly after that and, without saying anything to her, took it upon myself to demolish the old privy. I returned home to Wisconsin a day or two later and, of course, the inevitable happened; the new, modern plumbing system malfunctioned and it took several days to get it repaired. It was probably a good thing that I wasn't close at hand as she was somewhat unhappy with her little brother and probably would have "boxed my ears", as she did more than once, when I was a kid. Graciously Hosted By Socket, Inc.
.A program will be held in the afternoon following the business meeting. On Thursday, March 6, the historical society hosted a catered dinner for twelve participants of Leadership Miller County. The menu included ham 'n cheese sub-sandwiches, apple salad, potato chips, fresh vegetables and dip, and carrot cake. Eleven members of the Society also joined the group for lunch. The Leadership group consists of interested men and women who are interested in the county's government and history and included students, business persons and people from the various towns including mayors, etc. A nominating committee has been assigned by the president to present a slate of new officers and board members to the general membership at the April quarterly meeting for election. Those needing to be elected include the president, vice president secretary, treasurer, and 3 board members who will serve 3 year terms. On Wednesday, February 20, the Miller County Historical Society board held its monthly meeting in the multifunction area of the lower floor of the new addition. Those present were Joe Pryor, Joe Cochran, Donna Carrender, Judy Pryor, Wanda Wright, Carl McDonald, Jim Clark, Helen Schulte, Peggy Hake, Nancy Thompson, and Betty Kallenbach. One of the most exciting items discussed were the plans for the ongoing renovation of the original museum area of the old Anchor Mill Hardware and Feed store. Work has progressed such that we now have most of the wiring placed for new lighting and the dry wall and insulation isgoing to be installed very soon. The energy expenditure for heating and cooling should be much less after the insulation is installed. Architectural plans have been completed as to the layout and design of the seven model rooms which will represent historically accurate types of homes and stores of the county one hundred years ago. These displays will be placed in such an order as to tell a story as one walks from one to the next. This is a feature that is becoming more common in museums these days and we hope you will like it when we are finished. The new addition just finished this fall includes a large library and research area. We have purchased new shelving to improve access as well as betty protect our books and files. New computers have been installed and we are anticipating having access to high speed internet which will be helpful for research purposes. Because of the ongoing construction, we are not sure as to the date this year for opening the museum. But I am sure that it certainly will be a "Grand Opening"! Volunteers can always be helpful for maintenance and organization. Mondays are our regular work-day. If you can, drop by some Monday, we can certainly use your help. May 10---Open House @ Museum 1-3 p.m.
May 20---Board Meeting @ 10 a.m.
Jun 17---Board Meeting @ 10 am. Jun 21---Ice Cream Society 11:30 - 3 p.m.
Jul 13----Quarterly Meeting @ Museum 1 p.m.
Jul 15----Board Meeting @ 10 a.m.
Aug 19---Board Meeting @ 10 am. Will be held on Sunday, April 13th, with a carry-in luncheon to be served at one p.m.
Officers and Board Members will be elected in the afternoon by the general Membership.